Chinese Logging in Gabon: Neocolonialism or a New Way Forward? I lived in China for several years, and by the time I left in 2014, I had witnessed astounding economic growth. As a student at the Erb Institute, I was eager to understand the impact of China’s rapid expansion and consequent search for natural resources from the perspective of an African country. China’s scramble for resources has made its mark on Africa, as economic links between Africa and China have grown from negligible to monumental. This past May, with funding from the Erb Institute, I visited Gabon hoping to gain insight into the trade-offs African governments and peoples face as they invest in greater economic partnership with Chinese corporations. Do benefits on a macro scale (large infrastructure projects, resource concessions) translate into improved livelihoods (jobs, access to new markets)? And what are the broader effects of the Chinese economic and cultural presence? Gabon’s population is only 1.5 million, but it possesses incredible natural resource wealth, most notably in oil, mining and timber. Unlike many African countries, most of Gabon’s rainforests are still standing—I was amazed to see miles and miles of unbroken rainforest. 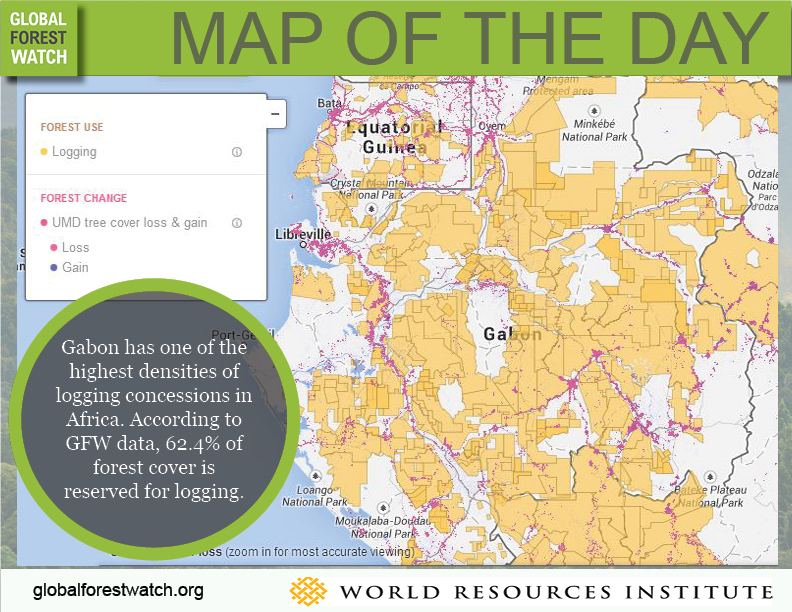 And yet, with more than 60 percent of this forest reserved for logging, Gabon has the highest density of concessions in all of Africa. While European logging companies have traditionally dominated the sector, Chinese firms now manage more of it. About 75 percent of all African timber ends up in China, and Gabon is by far China’s largest supplier. This growth exemplifies China’s model of engagement across Africa: supply contracts in exchange for infrastructure development. China’s state-financed development projects have grown, but the Chinese government and corporations have favored Gabonese elite in securing access to resources—problematic in a country that boasts a surprisingly high GDP coupled with high indicators of inequality. I approached Chinese economic involvement in Gabon with a wary eye: I had seen firsthand how destructive China’s thirst for resources had been within its own borders. But African governments have largely welcomed Chinese cooperation, which is framed in the language of “partnership” rather than “aid.” Presenting itself as a partner—a developing country in its own right—China offers “no-strings-attached” funding. Gabonese President Ali Bongo Odimba is particularly invested in broadening his country’s partnerships and diversifying its industrial portfolio. As the oil sector becomes less profitable and reliable, building logging-for-export enterprises is even more important to Gabon’s financial future. While Western institutions may cry foul about China’s “annexation” of Africa’s natural resources, African leaders’ eagerness to access new sources of foreign investment capital and diversify national economies may represent a sound trade-off, at least in the short term. I focused on Gabon’s second-largest city, Lambaréné. Situated on the Ogooue River, Lambaréné is dominated by forest concessions. It is also home to significant Chinese infrastructure and agricultural projects. I met with several people who shed light on how the Chinese presence is playing out on the ground. Three recurring themes emerged: questions about Chinese employment practices, frustration with a lack of Chinese integration, and issues of environmental compliance. With respect to environmental compliance, the head of a local environmental NGO said that multiple requests to review logging concessions’ sustainable management plans—which the law requires to be made available as public record—had been ignored. She described how logging barges move cut wood and equipment at night, illegally. A 2010 ban on exporting uncut logs was designed to boost the local economy through higher-value manufacturing. “There is no regulation, no oversight,” she said. My time in Gabon left me with more questions than answers about the long-term impact of China’s increasing role there. Questions remain for many African countries: Do Chinese practices mirror neocolonial extraction, or do they represent a new model of economic partnership? Will Chinese engagement help improve livelihoods or worsen inequality? What does the Chinese presence mean for a continent seeking to develop in a sustainable way?